MOSCOW, Russia (CNN) -- An impassioned U.S. Secretary of State Hillary Clinton, speaking to students at Moscow State University on Wednesday, admonished those in the U.S. and Russian governments who haven't moved beyond a Cold War mentality. 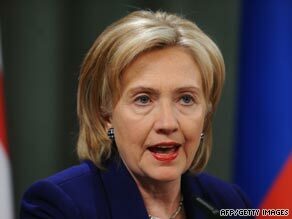 Hillary Clinton criticized people "living in the past" over the Cold War. Clinton said such people are "living in the past" and aren't able to cooperate on issues such as missile defense because they "don't trust each other." She also called on the nations to find common ground, saying they "shouldn't end all cooperation" just because they can't agree on everything. "Let's be smarter than our past," Clinton said, offering to bring a "new attitude bring to the relationship." The town-hall meeting followed sessions Tuesday with Russian President Dmitry Medvedev and Russia Foreign Minister Sergey Lavrov that yielded no breakthroughs on arms control, Afghanistan or possible sanctions against Iran as it pursues a controversial nuclear program. Clinton wraps up her trip to Russia on Wednesday.